The bitter cold this winter has heightened the possibility of frozen household pipes. 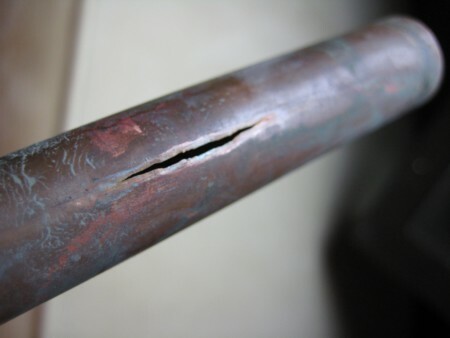 Because water expands when frozen, those pipes could burst, causing extensive damage in your homes. Water supply lines located in unheated areas such as the basement, crawl space, attic and garage are, not surprisingly, very susceptible to freezing in frigid areas. So are pipes under kitchen and bathroom cabinets or that run up outside walls with inadequate insulation. Set your thermostat to the same temperature for day and night. Winter is the time your heating costs are already taking a hit, but keeping the temperature up at night can prevent an even more costly burst pipe and the damage it causes. Open bathroom and kitchen cabinet doors so warmer air circulates around your plumbing. Be sure, however, to move any harmful cleaners and household chemicals out of reach of children and pets. If you have any water supply lines in the garage, keep the garage door closed. If you’re leaving your home for even a few days, set your thermostat to no lower than 55 degrees F.
If you turn on your water faucet but only a trickle comes out, there’s a good chance you have a frozen pipe. The first thing you should do is keep the faucet open. If the water supply pipe hasn’t broken yet, you can try to thaw it out. Once the ice is partially melted, keeping the faucet open allows water to run through the pipe to help melt the remaining ice. Attempt to find where the pipe is frozen. Likely places for a frozen pipe are those running along exterior walls or where the water service enters the house through its foundation. If you can find and access the pipe, DO NOT USE a blowtorch, kerosene or propane heater, or other heating source with an open flame. You may melt the ice but burn your house down instead. You can, however, wrap an electric heating pad around the pipe, or use an electric hair dryer to direct hot air on the pipe. You can use a portable space heater in areas such as kitchen and bathroom cabinets, but keep the heater away from flammable materials by placing it outside the cabinet while blowing heated air toward the pipes. You can also wrap pipes with towels soaked in hot water from a faucet that is working. Keep applying heat until full water pressure returns. If you can’t find where the pipe is frozen or you can’t access the pipe, call a plumber. Drain all sprinkler supply lines and water from a swimming pool following an installer’s directions. Close inside valves supplying outside faucets and open those faucets to train them. Leave the outside faucets open so any water left in the pipe can expand without causing a pipe break. This entry was posted in HVAC and tagged frozen pipes. Bookmark the permalink.